The term CRUD refers to the major functions needed in any database application to allow basic functionality : create, edit, delete and view records. CRUD scaffolding is where you use a program to describe your database (tables and fields) and then the program generates the necessary CRUD pages . There are many CRUD scaffolding utilities. Many of them are free, and some are available as an online service. For example, PHPScaffold.com asks you for a SQL dump of your MySQL/MariaDB table structure and uses it to generate a basic CRUD application written in PHP. Quick and advanced search: You don't just browse data of your tables sequentially. You can sort and search them. You can also use the advanced search filters to combine up to 12 search criteria. 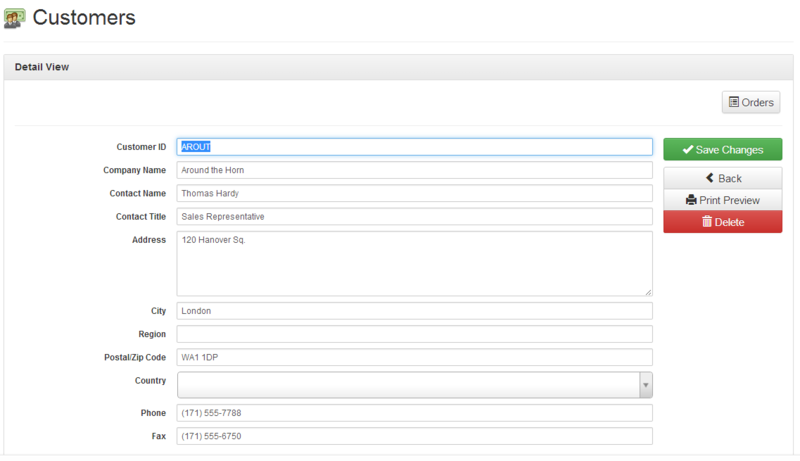 Lookup fields: A feature that allows you to link tables together, also known as foreign key one-to-many relationship. Users and permissions: CRUD utilities allow any user to have unrestricted access to data, which makes them suitable for development purposes only. AppGini, on the other hand, allows you to define groups of users, each with its own controlled permissions. So, you can use the generated application in your production environment knowing that your data is safely protected. Handling images: AppGini enables you to set one or more fields of your table as images. This enables uploading and displaying of images easily. File uploads: AppGini also enables you to set one or more fields as file upload fields. You can specify the allowed file types and sizes. Data formatting: AppGini offers many possibilities for formatting field contents. You can display them as email or web links, checkboxes, drop-down menus, radio buttons. You can also format data as curreny figures, rounded numbers, ... etc. You can also create custom formats if the built-in ones are not enough. Want to know more about AppGini? For more info about CRUD, please refer to the wikipedia article. For more info about CRUD scaffolding, please refer to the wikipedia article.